According to the University of Surrey England, sleep deprivation can put more than 700 genes out of sync. In addition, hormones become uncoordinated and can have many detrimental health effects. Sleep is one of the most important activities for the health of your body. There is a false notion that individuals do not need a full night sleep, but studies have revealed that a lack of sleep can even kill you. According to the University of Surrey England, sleep deprivation can put more than 700 genes out of sync. In addition, hormones become uncoordinated and can have many detrimental health effects. Some major hormones associated with sleep include the following: Melatonin, growth hormone, thyroid-stimulating hormone, ghrelin, leptin, insulin, epinephrine, and cortisol. 1. Sleep helps influence your hunger hormones. Ghrelin is an important hormone that tells your brain to consume food. Leptin is another hormone that has the opposite effect and tells your body that you are full. Studies from the University of Luebeck and the University of Chicago reveal that a lack of sleep increases ghrelin levels and decreases leptin levels, which drives up food cravings. 2. 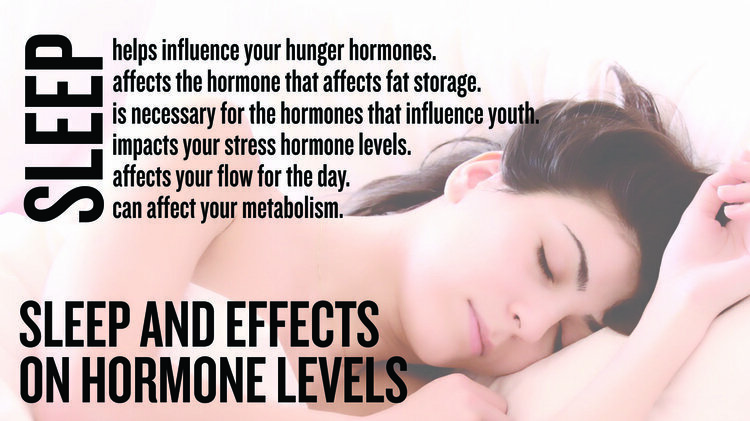 Sleep affects the hormone that affects fat storage. Not only does your body crave more food when you do not get enough sleep, but your body also increases fat storage via insulin. Insulin is a storage hormone that delivers glucose to your cells to burn, or to your liver and muscle cells to store for later use. Problems occur when the cells that were supposed to listen to insulin starts to ignore its command. Healthcare professionals call this "insulin resistance,” which causes the glucose to be stored as fat instead of glycogen. Another study from the University of Chicago shows just one night of inadequate sleep can contribute to insulin resistance and puts you at a greater risk for obesity and type 2 diabetes. 3. Sleep is necessary for the hormones that influence youth. Human growth hormone is a critical anti-aging hormone. This hormone makes it easier to build muscle, burn fat, and have a healthy immune system. Your body produces growth hormone during deep sleep, and as you age, you produce less of it. A study in the Journal of Psychiatry & Neuroscience showed that another way to produce less growth hormone is by sleep loss. 4. Sleep impacts your stress hormone levels. Cortisol is a stress hormone that is beneficial in the short run, but may be detrimental in the long-term. In the short term, it can improve awareness; cortisol can do its job and then leave. But, having high cortisol levels in the long run will break down your muscle, store fat, and decrease immunity. Be careful if you are a coffee drinker. One cup of coffee can raise your cortisol levels by 30%, which can stay elevated for up to 18 hours. Cortisol also lowers the neurotransmitter serotonin, which converts to melatonin. 5. Sleep affects your flow for the day. According to the Central European Journal of Medicine, melatonin controls your sleep/wake cycle by causing drowsiness and decreasing your core body temperature. In addition, melatonin is an antioxidant and protects the DNA from harmful biological waste products, called free radicals. Sleeping with proper hygiene at a consistent time will help you feel less drowsy throughout the day and boost your immune system. 6. Sleep can affect your metabolism. A study published in the Medical Hypotheses showed that sleep deprivation alters your body’s production and action of thyroid-stimulating hormone. Thyroid-stimulating hormone stimulates the thyroid gland to produce thyroxine (T4), and then triiodothyronine (T3), which influences metabolism, growth, and development. Make sure you get at least seven hours of sleep per day so that your body can reap the benefits from normal hormonal release. Some individuals need more than nine hours. Learn how much you need and try to adhere to that schedule. Brennan, A. M., & Mantzoros, C. S. (2006). Drug insight: the role of leptin in human physiology and pathophysiology—emerging clinical applications. Nature Reviews Endocrinology, 2(6), 318-327. Burger, K. S., & Berner, L. A. (2014). A functional neuroimaging review of obesity, appetitive hormones and ingestive behavior. Physiology & behavior. Carrillo-Vico, A., Guerrero, J. M., Lardone, P. J., & Reiter, R. J. (2005). A review of the multiple actions of melatonin on the immune system. Endocrine, 27(2), 189-200. Davidson, J. R., Moldofsky, H., & Lue, F. A. (1991). Growth hormone and cortisol secretion in relation to sleep and wakefulness. Journal of Psychiatry and Neuroscience, 16(2), 96. Gary, K. A., Winokur, A., Douglas, S. D., Kapoor, S., Zaugg, L., & Dinges, D. F. (1996). Total sleep deprivation and the thyroid axis: effects of sleep and waking activity. Aviation, space, and environmental medicine, 67(6), 513-519. Hardeland, R. (2005). Atioxidative protection by melatonin. Endocrine, 27(2), 119-130. Möller-Levet, C. S., Archer, S. N., Bucca, G., Laing, E. E., Slak, A., Kabiljo, R., ... & Dijk, D. J. (2013). Effects of insufficient sleep on circadian rhythmicity and expression amplitude of the human blood transcriptome. Proceedings of the National Academy of Sciences, 110(12), E1132-E1141. Nedeltcheva, A. V., Kessler, L., Imperial, J., & Penev, P. D. (2009). Exposure to recurrent sleep restriction in the setting of high caloric intake and physical inactivity results in increased insulin resistance and reduced glucose tolerance.The Journal of Clinical Endocrinology & Metabolism, 94(9), 3242-3250. Pohanka, M. (2013). Impact of melatonin on immunity: a review. Central European Journal of Medicine, 8(4), 369-376. Schmid, S. M., Hallschmid, M., JAUCH‐CHARA, K. A. M. I. L. A., Born, J., & Schultes, B. (2008). A single night of sleep deprivation increases ghrelin levels and feelings of hunger in normal‐weight healthy men. Journal of sleep research,17(3), 331-334. Spiegel, K., Leproult, R., L’Hermite-Balériaux, M., Copinschi, G., Penev, P. D., & Van Cauter, E. (2004). Leptin levels are dependent on sleep duration: relationships with sympathovagal balance, carbohydrate regulation, cortisol, and thyrotropin. The Journal of clinical endocrinology & metabolism, 89(11), 5762-5771. Takahashi, Y., Kipnis, D. M., & Daughaday, W. H. (1968). Growth hormone secretion during sleep. Journal of Clinical Investigation, 47(9), 2079. Li, D. X., Romans, S., De Souza, M. J., Murray, B., & Einstein, G. (2015). Actigraphic and self-reported sleep quality in women: associations with ovarian hormones and mood. Sleep medicine, 16(10), 1217-1224. Zhang, X. B., Lin, Q. C., Zeng, H. Q., Jiang, X. T., Chen, B., & Chen, X. (2016). Erectile dysfunction and sexual hormone levels in men with obstructive sleep apnea: efficacy of continuous positive airway pressure. Archives of sexual behavior, 45(1), 235-240.
de Zambotti, M., Colrain, I. M., & Baker, F. C. (2015). Interaction between reproductive hormones and physiological sleep in women. The Journal of Clinical Endocrinology & Metabolism, 100(4), 1426-1433.